You see a runaway train racing down the tracks. If it continues on, it will surely hit five people who are currently on the tracks and kill them. However, there is a switch that you can access that will divert the train down a side track where only one person is, and will be killed. Is it more ethical to do nothing, or pull the switch and kill one person? What if the single person was a baby and the five were old people? What if there was also a fat man that you could push onto the tracks, surely killing him but also saving all six of the others? What if instead of the fat man, you could throw yourself on the track for the same effect, but kill yourself in the process? If you’re in the right point of philosophical exploration, these questions might delight or annoy you. They make for controversial dinner party conversations. After a few trolley-related problems with more and more elaborate setups or ways to twist the knife, it often becomes absurd. There’s a classic extreme version of this, sometimes named “The Ultimate Philosophical Problem”, where every possible ethical or philosophical curveball is combined into a Rube Goldberg dilemma of sheer insanity. 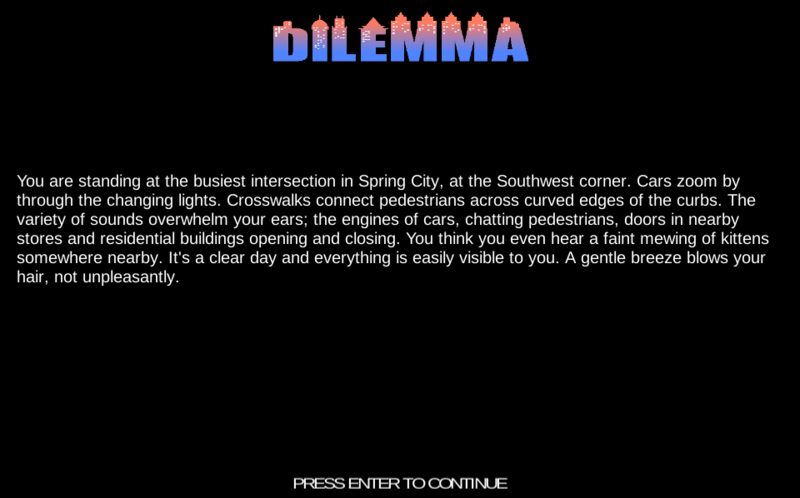 “Dilemma” is basically that gag, but as interactive fiction. It’s a Unity game with a very light parser. You are initially presented with the situation of an old man who is about to be accidentally run over by a bus and you can SAVE THE MAN or DO NOTHING. To make either choice you have to click the dialogue box and type in your option. After you’ve made a final decision, it explains the outcome and tells you how many outcomes you’ve discovered. A time portal allows you to explore the space of options, which gradually open up over multiple replays. There’s 51 different outcomes, so it explores some very broad scenarios directly and tangentially related to the old man and the bus. In full disclosure, I should admit right now that I’m not a fan of the trolley problem. I find it a clumsy and indirect way to explore ethical choices. The original question basically boils down to “are you a blunt utilitarian?” and then that opens up to all sorts of silly meta-debates about the calculus of utility. That aside, I am unsure how I feel about Dilemma. In general I find philosophical conundrums to be written in a clumsy-but-terse style. Typically you are presented with a nearly contextless situation, where most of the text is directly spelling out the elements of the situation. 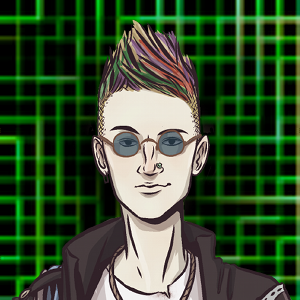 Dilemma wants to tell an interactive fiction story, so there is some narrative and flavour around the bulges of the dilemma. By design it has to suffer the egregious presentation of philosophical dilemmas, as well as a small but wildly textured interactive fiction world. Some sections feel like a “just get words down” first-pass on writing. Others are quite evocative, like the mourners carrying a casket on the bus. I’m willing to give Leonora the benefit of the doubt, and suggest the game could benefit from an extra editing/crafting sweep, but it definitely does its job currently. The Unity engine approach is okay. It runs in the browser just fine. Some quality-of-life polishing would be nice. I spent most of my game laboriously mouse-clicking the parser area to type my two words in, each round. Later I found that you could press spacebar and it’d activate that area for you. I suspect that — barring any later-game fireworks — this might be better presented as a hypertext fiction, like in Twine. Even the hidden interactions could be obscured somewhat. At a meta-level the game is exploring all the possible dilemmas and their resolutions. This is at its most fun when a new little vista of dilemmas is exposed to you. But the design encourages you to find all 51 outcomes, so it can feel like a brute-force search through a tree of possibilities. As such, 51 outcomes is maybe too many. I also feel like the author missed an opportunity to have 52 outcomes, and record them as thematically grouped cards in a deck. Overall I like the idea, but have minor issues with the presentation. It’s worthwhile trying out if you’re a fan of philosophical and ethical puzzles.